Here at Eastwind Rare Breeds Farm you will see some of the most endangered farm animals in the world. These animals free range in natural surroundings just the way they were meant to. In this artificial environment, pigs soon loose the ability to fend for themselves and need scientifically formulated diets and controlled temperature housing to grow and reproduce. Chemicals, vaccines and hormones are also widely used to grow the majority of pork available today. At Eastwind we are presently focusing on the Large Black Pig breed as they have become almost extinct in Australia. The Rare Breeds Trust of Australia (R.B.T.A.) 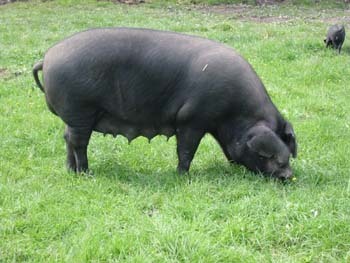 estimates that there are no more than 60 breeding sows left.